6:30- I roll out of bed, wishing I had just a little more time to sleep. I'm always in a pretty good mood once I get up, but getting up for me is tough. I wish I was a naturally early riser, but I'm not! 6:30- I jump in the shower- super quick, regretting that I didn't get up just a little bit sooner. I reflect on the day. Some of the best thinking time is done in the shower. 6:40- I wake my husband and tell him to go and wake up our four year old. He gets C. dressed every morning (and he's done it since he was born! I know I'm lucky!). Hey, if I have to be up early so do you hunny! 6:40-7:15- I get ready while C is getting ready. I have mastered the art of getting ready quickly (that way I can sleep longer). If I'm lucky my 2 year old girl will wake up before I leave. It's my only chance to see her before the afternoon. I get her some milk and settle her in my bed for Mickey Mouse Clubhouse. 7:15- We rush out the door, leaving hubby and K. behind. Hubs doesn't have to be at work until 9:30-- must be nice! He gets K. ready and drops her off at daycare before going to work. 7:30- This is when I should arrive at school, and I do as long as traffic cooperates perfectly... We really only live 10 minutes from the school (that gives me five extra, right?). As I walk down the hall I pass all of my sweeties sitting in the hall waiting with the aide. It almost seems like I'm a celebrity with all the waving and "hey, Mrs. Morse!". I quickly put down my stuff, clock in, and glance at my e-mails. 7:40- I take C. down to his preschool class (I LOVE having him at school with me!). A quick kiss and a "hi" to his teacher. Generally, I'm running up the stairs back to my room as the bell rings. 7:45- Kiddos come in, so excited to tell me all about the night before. I give each one a hug, handshake, or high five, and they get started on their math tubs. I love starting with math tubs because the late bell doesn't ring until 7:55. Morning work is hard to do when every child starts at a different time. Children work on their tubs while I do attendance, check their folders, send lunch money and notes to the office, and then eventually circulate around the room to see who needs help. There's usually those couple who need help daily. They hunker down at my table and we do their tub together. 9:10- Calendar- I love this time of the morning because I change it up depending on the needs that day. Sometimes it just turns into a read-aloud time, or a sharing time, or a "come to Jesus meeting" if we've had "that kind of day" the day before. But many days, it's just calendar on the Promethean board. 10:00- Writing- We normally do Daily News before a quick writing lesson. Then, the kids get busy writing. 10:45- It's finally time to leave the room!! PE time. I take my kids to the gym for PE while I run around like a crazy person trying to get stuff done. This is time to check and respond to the 50 e-mails I've received all morning, make copies, check my teacher work box, straighten up the room just a tad (because I'm OCD), plan, use the restroom (I haven't been since I left the house at 7:15)-- all of you are teachers why am I trying to explain. You know that 30 minutes flies by! 11:15- Pick up my kids from PE and go straight to lunch. My scheduled time is 11:20, so it works out perfectly to take their lunchboxes to PE and not waste any time going back to my classroom. 11:20-11:45- Lunch- a nice and quiet break to eat my lunch-- not! That doesn't ever happen. We sit in the loud, sometimes hectic lunchroom with our kids, while they peck you to death coming to the table with first grade concerns (I can't open my water bottle, I need ketchup, Jack is in my spot, I need to go to the bathroom, my mom said I could get ice cream but I don't have any money......). It's not really an enjoyable lunch, but at least it's a time to sit down and do a little teacher talking for a few minutes. 11:50-12:20- Recess- There's no parent/aide/assigned teacher to watch the kids at recess. But, that's ok, I don't mind getting out and breathing a little fresh air (unless the air is below 40 degrees- then I'm freezing- remember I live in Alabama- this southern girl doesn't like the cold). I go out to the playground with 3 other first grade teachers. This is our time to catch up on the day. I love these girls. We plan a little, problem solve, and just chat. Sad how it turns in to school related stuff more than personal stuff, but that's how it normally goes. 12:20- As the kids come into the room, they grab their reading tubs and get started. This is my time to work with students, and a time I wish I could magically morph into five different people. My favorite thing to do during this time is reading conferences. I love reading with the kids every day, and they love reading with me. It's not uncommon to have kids asking "are you going to read with me today?" or "I picked out a new Level I book and I want to read it to you." First grade teachers are in the process of some professional development to learn more about flexible small groups. I won't lie-- this is not how I like to spend my reading time, but I'm willing to give it a chance. So, after conferring with several children, while at the same time helping Susie who can't log into the computer, and Johnny who doesn't understand how the tub works, and Billy who is playing in the hall, and Amy who is arguing with Tucker about which book they are going to listen to, it's time to clean up. This is the most exhausting time of the day. 1:00- 1:40- Phonemic awareness, phonics, and comprehension lessons. 1:40-2:20- Specials. I take my kids to specials 4 days a week. On Fridays, I have to go to the computer lab with them. While they are at specials I pack up their folders and put them on their desks. We used to pack up before specials but it was cutting into reading time, so now I do it during my "break." 2:20- I pick up my kids and we book-it back the room so the early kids can quickly pack up before the first bell rings at 2:25. 2:35- The "normal" bell rings. I take my kids up to carpool and head back to the room. This is usually my time to decompress and talk a little. It seems like each day of the week there's something to do right after school. On Mondays we have faculty meetings; On Tuesdays my grade level meets and plans; Every other Wednesday I have a small group book study; On Thursdays I tutor (my choice-- good money! ); Nothing on Fridays! 3:45- This is about the time I start working on things for my classroom. 4:15- Time to leave school and run to the grocery store or run another errand. It is MUCH easier to shop without the kiddos! 5:00- I pick up my daughter (who is bouncing up and down with excitement) from a home daycare. I have to be there by 5:00. Many days I'm speeding to get there in time. 5:20- I swing by my mother-in-law's to pick up my son (he only goes to school until 12:30, so my MIL picks him up and keeps him in the afternoons). I check C's folder and sign his sheet right then while I'm still in the car-- the mornings are too busy. My MIL is a talker... so we talk... and talk... and talk. By this time, all I want to do is get home. 5:30- Thankfully, I live 3 miles from my MIL and I can get home quickly. I get the kids in the house and settled playing. I try to sit down for a couple of minutes and talk to the kiddos. 5:45- Start cooking dinner, emptying the dishwasher, washing a load of clothes, breaking up fights between the kids. 6:30- Hubby arrives home-- time to eat! 7:00- Kids go in the tub. They play while my husband and I clean the kitchen and talk (a few minutes of uninterrupted adult talk). Wash hair, get on to kids for dumping water on the floor, clean up the mess, get them out and dressed for bed. 7:30- My husband reads to my son, while I rock/sing/read/pray with my daughter. I love this time of the day. I'm thankful that she's two and still enjoys wock wock time. She cuddles right up and we generally fall asleep rocking together. 8:15- I lay her in the bed and go tell my son good night. My "me time" has begun for the day! I've been trying to do better with running (well it's more like a jog) on the treadmill. I love to play my worship music loud and drown out the rest of the world. It's my time to reflect on the day, pray, and run out all the stress. I also get around to a little blog-stalking, crafting, washing more clothes, cleaning the house, and watching TV. Recently my husband and I have gotten into reruns of 24. What a great show! I check my school e-mail one last time (makes the morning time easier) before I go to sleep. I would love to go to bed by 11:00, but it's generally closer to 12:00 before the lights go off. Wow! That was much longer than I intended for it to be. If you made it to the bottom you deserve a prize. Join the party. 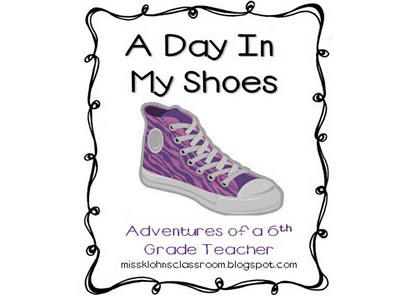 Link up with Adventures of a 6th Grade Teacher and share your day. I'm sorry, your day seems too packed. You really are "superwoman". I don't like to exercise late at night, but you just get it done. Congrats on running a smooth life :). nice post. Now you can use this b2b importers directory to promote kids footwears import & export business. WoW! I'm exhausted just reading this! 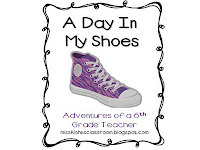 :) I just discovered your blog through Mrs. Wills' linky party. I'm really enjoying it! I want to do math tubs and teach 1st grade!!! I do do centers, or stations, as I call them with my 6th graders and they still love them! Now I know why when I email you at 11:30 or 12, you respond back : ) Love and miss you guys!